The earliest Egyptian writing developed from pictographs or simple drawings by prehistoric people. These pictographs were crude drawings of objects that were known to everyone no matter what language they spoke. Pictographs could not express emotions, thoughts, or beliefs. They also could not express past, present, or future. The earliest known writing system or script emerged from this system of pictographs. It is called hieroglyphics and it was in place before 3100 B.C. Hieroglyphics means sacred carvings, and each carving represents a particular object or thing. 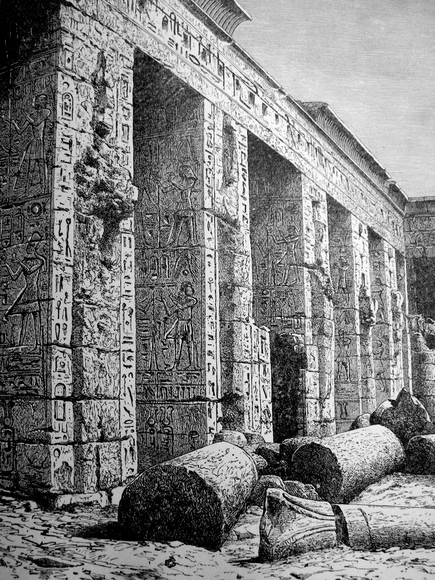 The ancient Egyptians never actually developed a true alphabetic system. However, by 3100 B.C, they had developed a complex language system that included its own grammar, syntax, and vocabulary. The Egyptians would continue to use hieroglyphics during the development of other writing systems. The Egyptians broadened their writing abilities by introducing a system of phonograms and ideograms. Phonograms represent the sounds that form the words. Unlike pictographs, phonograms cannot be understood from people who do not speak the language. Egyptian hieroglyphics contain 24 of the most commonly used phonograms. Ideograms were placed at the end of a word that was spelled out in phonograms to clarify its meaning. In addition, two cursive writing forms emerged from hieroglyphics. These new styles increased the writing speed for business and literary texts. Hieratic writing was a simplistic form of hieroglyphics. It was used until 800 B.C. Each hieratic sign or character represented a simplified form of a hieroglyphic sign. Both could be written vertically and horizontally. However, they differed because hieroglyphics were usually carved in stone while hieratic was written on papyrus, wood, leather, or stone. Another form of cursive called demotic was introduced in 700 B.C., and used for popular writing. It introduced new grammatical forms, and new vocabulary. However, it was difficult to translate and read. The Coptic language developed when Egypt became Christian. The Coptic language had elements of ancient Egyptian dialects, and it used the Greek alphabet characters, with some new signs to replace Egyptian sounds that did not occur in Greek. The main advantage was that Greek alphabet contained vowels, allowing writers to produce a full and accurate pronunciation. Then in the seventh century Egypt was invaded by Islam, and Arabic became the official language. It was in 1799, during Napoleon Bonaparte's expedition into Egypt that one of his Lieutenant's Pierre Francois Xavier Bouchard would make a startling discovery. While gathering stones in an attempt to build up their fortifications, Bouchard was shown a a stone inscribed in three horizontal panels. At once, he realized its importance and he sent it to Cairo to be deciphered. As it turned out, the black basalt stone contained three versions of the same text. One panel was hieroglyphics, another was demonic, while the third was Greek. It was called the Rosetta Stone. It would not be until 1837 that they had a true translation. Once it was understood, after after many years of trial and error, scientists began successfully and accurately deciphering Egyptian hieroglyphics and demotic writing styles.